Earl Moore (July 29, 1879 – November 28, 1961) was a professional baseball pitcher who had a 14-year career in Major League Baseball. Moore's sidearm throwing style earned him the nickname "crossfire". His contract was purchased by the Cleveland Blues from Dayton, Ohio for $1000. On May 9, 1901, he pitched the American League's first no-hitter, only to lose the game in the tenth inning. He was also the first pitcher in the 20th century to lose a no-hit game. In 1903, he led the league with a 1.77 ERA, going 19–9. 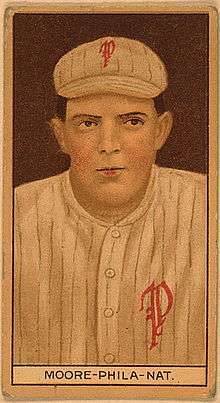 He was traded to the New York Highlanders in 1907, and then to the Philadelphia Phillies in 1908. 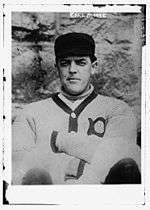 He won a career-high 22 games for the Phillies in 1910, leading the league in strikeouts. He lost 19 games the following year. In 1913, he was traded to the Chicago Cubs. His career record was 161–154 with a 2.78 ERA. He pitched 230 complete games. Wikimedia Commons has media related to Earl Moore.